Hospice care is never an easy topic to discuss. However, it is one that we must all eventually deal with for our loved ones. Our goal at Infinite Hospice Care is to help people live better and we believe in providing each patient and their family care to alleviate pain and suffering, whether physical, emotional or spiritual. Our dedicated team is always by your side, so you can rest assured that we will do everything we can to improve your quality of life for as long as possible. Infinite Hospice Care provides the best hospice care in Encino to patients and their families. Hospice care was designed to give individuals with incurable diseases the opportunity to live a life of dignity and comfort during their final days. Although an illness can affect how a person lives, there is still so much that can be done to improve the physical comforts and well-being of those suffering. We help people remain as mobile, alert and engaged for as long as their conditions will allow. By surrounding our patients with warmth as well as having them engage in activities that are meaningful to uplift their spirits, we strive to make their lasting days as pleasant as possible. 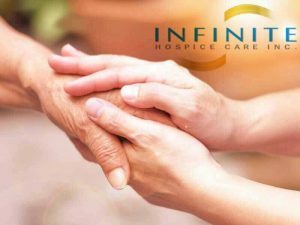 Infinite Hospice Care is the best hospice care in Encino and we are there for you with compassionate care and knowledgeable guidance every step of your journey. Our services include medical care, spiritual counseling, pain management, respite, and bereavement care. Our mission at Infinite Hospice care is to provide hospice services that are designed to deliver palliative care, alleviate the physical, emotional, social and spiritual discomforts of an individual who is experiencing the last phase of their lives. We will work to meet your specific physical, emotional and spiritual needs and wishes, while respectfully guiding and empowering you and your caregivers with the knowledge and ongoing support. If you have any questions or are interested in learning more about our other locations, please feel free to contact us today. We look forward to serving our community and strive to always be by your side.